Mariners’ payroll is right there with Yankees and Dodgers, but having to resort to Ichiro, 44 and 0-for-10 in spring, is not a good way to start. Jerry Dipoto and Scott Servais enjoy hearing about the Mariners’ historic futility the way grandkids enjoy hearing about the Depression from grandparents. Yeah. Too bad about that. Tough times. Can we go out now and play with the dog? Yet with each passing year of emptiness, the Seattle baseball moans grow more pitiful. Yes, the current general manager and manager have had only two swings, and they were figuratively forced to use balsa bats, representing the fecklessness of previous regimes. But hey, the bosses invited the franchise’s history into the contemporary discussion when they ghosted up Ichiro. Servais confirmed after the team’s Safeco Field workout Wednesday that despite the late hire, despite a sore calf, despite taking a pitch off his helmet, despite going 0-for-10 in spring training and despite being 44 years old, he’ll be the Opening Night starter (7:10 p.m. Thursday) in left field and hit ninth. No, it’s not perfect. It’s not even good that the Mariners didn’t have a young, healthy outfielder on the edge of MLB readiness to fill in until regular starter Ben Gamel returns to health. Instead, they reached back into their feeble history for a golden figure, hoping the shiny part will keep people from staring into the void. That’s the Mariners history. It just continues. I’m not going to suggest that starting Ichiro in 2018 is strike three for Dipoto and Servais, and that if the season goes awry, they should ousted. The hole they inherited was deep, dark and wet, requiring more than three years to escape. What I will say is that while I see the logic in their cautious approach to team-building this winter, including the interim hire of Ichiro, Dipoto, Servais and owner John Stanton better bring it hard at midseason upgrade time — assuming the team is not again swathed in bandages and tangled in IV-bag tubes. The Mariners are in that curious middle ground that has developed in baseball, thanks largely to the 2016 adoption of a collective bargaining agreement that favors owners. Seattle is not among the so-called group of seven super teams — one of which is Cleveland, the opening foe at Safeco Field — nor is it among the larger cohort of the hopeless who feel compelled to engage in NBA-style tanking. Yet there’s not that many dollars that separate the Mariners’ 2018 payroll from some of the game’s stalwarts. The opening day roster is anticipated to cost around $165 million. Amazingly, it’s about the same as payrolls for the big-ticket Yankees ($167M) and Dodgers ($170M), according to an Associated Press survey. Ichiro’s presence in the starting lineup is strongly suggestive of the chronic failure to get serious bang for the baseball buck in Seattle. The urgency is, of course, driven by the cruel fact, now memorized by the youngest schoolchildren in the Northwest: The Mariners are 16 years without playoffs, longest current lameness in American pro sports, the most festering sore in the body of four playoff appearances in 41 seasons. A closer examination reveals something that should always chap the backsides of Mariners fans more than any other fact about this haplessness. In the time since the unicorn of 116 wins in 2001, the Mariners have managed six winning seasons. Elsewhere in the American League West, the decrepit A’s have seven. The Rangers have eight. The Angels have nine. The Astros have nine. As you can see, the division has not been a powerhouse this century, yet the Mariners allowed that vulnerability to go unexploited. In the period since ’01, only two AL West teams have won the World Series — the 2002 Angels and the 2017 Astros. In fact, only three other times have AL West teams made the Series — the 2005 Astros (when they were in the NL West) and the Texas Rangers of 2010 and 2011. Nothing, of course, for Seattle and Oakland. Pathetic. Why emphasize the division outcomes? Because it’s the easiest route to the post-season: The Mariners have only to be better than four teams, fercripesakes. Until the Astros relocated leagues in 2013, the Mariners had only to beat three teams, the greatest gerrymander in MLB for almost two decades. And the Astros in their first two AL seasons lost a combined 202 games. The Mariners idled so long that the Astros were able to stockpile premium draft picks (George Springer, Carlos Correa, Lance McCullers, Alex Bregman) from their annual tankings and vault over the Mariners to where they are the early betting favorites to repeat the title run. Ceding the division title to the Astros leaves the Mariners to fight with a host of middling teams for the two wild card berths. It isn’t implausible to think that they might make it happen, especially with an offense that features a rare balance of speed with power. But the lack of depth, illuminated by the presence of Ichiro, after years of trading away future prospects, means that all varsity hands have to stay healthy and productive. And that means they have to get lucky. But already from spring training the Mariners are missing Gamel, set-up reliever David Phelps and starting pitcher Erasmo Ramirez. As grandparents will tell you, don’t expect much from luck in a depression. The M’s open their season on the first night of Passover. Coincidence? Aliens? Pharaohs? I’m going with the offense to the Greek gods by deploying the trident the wrong way. I can only assume that the Tacoma Rainiers will be playing with only 6 defenders this season, since there are no outfielders in the organization. That’s because the quality of pitching is so good the balls will never leave the infield. Well Geez Louise! I was feeling bad enough this evening as I was sitting here mulling over the prospects for the Mariners, this being the eve of another season. Then I read this article by Art, I think I better get a hold of my bookie and retract that bet on the Mariners and their chances for winning it all this year. Since I’ve been 100 percent right on all my predictions, you’re welcome. Please sharing some of your savings with SPNW. Great! And if by some stroke of luck they do manage to win the series I’ll send you the bill for what I would have won! Nice of you to do that, Art! It’s like the cubbies. You gotta love these guys! Void. Mariners stardate 29/3/2018. Mission: to go where no ball club has ever gone before. More void. Take us out Zulu. Make it so. Oh wait! Let’s stop and get a cup of coffee on the ice planet Hoth. We’ll pick up a back of the rotation starter too. Deep breath, Kevin. You fell asleep with SyFy channel on. Hopefully at least some of your readers would be looking at (great) great grandparents. The curse of the Babe and of the Billy Goat…the M’s have the curse of Tim Lincecum. It’s kinda hard when the truth about real human is mostly gray, not black and white. Without Howard Lincoln and Slade Gorton, the SEATTLE Mariners would not exist. Gorton yes, Lincoln? Him and his buddy Chuck Armsrong were the downfall of the M’s, not the saviors. Uncle Howie continues to roam the corridors of Safeco as an Emeritus executive. If you don’t think he continues to whisper sweet nothings in the ear of Stanton you’re delusional. There’s no shame at admitting an illness, hopefully you’ll find help. JK, Go M’s. Stanton is a very strong man and will be a good owner. I do not believe that Lincoln has significant influence on Stanton, other than having many years of experience in how major league baseball operates. Stanton has brought in his own lieutenants to run the franchise sans Lincoln and Armstrong. He also made the Mariners the laughing stock of all professional sports with his delusion that he could run a sports franchise as he did Nintendo. Which he also almost ruined and is the reason he was kicked over to the Mariners. I really hope fans and the local media will treat Ichiro well, and not be nasty to him, like some were just before he left. We don’t need some brain dead moron saying having Ichiro around here makes him want to “vomit” for example. It’s perfectly ok to conclude that the team management stinks and they should not have brought Ichiro back. But aim that stuff at the team, not the player. The sad truth is, the team is not one good left fielder away from contending, and if they were, what left fielder was available that they passed on? They need bodies out there to get through 162 games. Old players hanging around is as much a part of baseball as anything else. The man is the 2nd greatest ever to play for the Mariners, right behind Junior. He has more hits than anybody who ever played baseball, except for 19 other guys. And not only that, he is a figure unlike any other in baseball history. He was taught the game by his father, whose teaching methods were abusive. 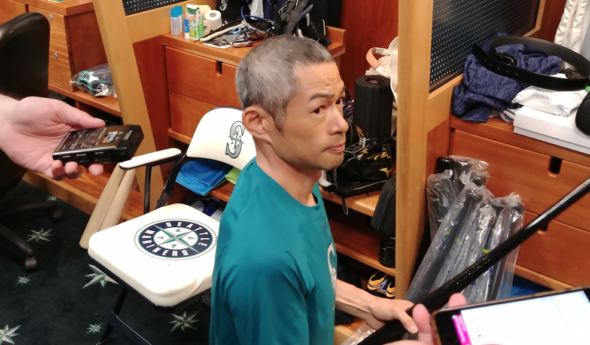 Ichiro does not speak to him now and says “he lies” when his Dad claims that it was fun for Ichiro as a kid. Ichiro has no life, no love, no desire, other than to play baseball. He wasn’t kidding when he said he might just die once he cannot play anymore. Let’s not blame this crappy season on him, and pretend that if only they had brought in some other scrub, the team would be contending. We gave Junior a pass for sleeping in the clubhouse and not being ready to appear in a game when called upon. Ichiro’s professionalism never wanes, even as his skills diminish. He deserves a warm welcome. At the very least. It’s debatable, but I would take Johnson and Edgar before Ichiro on your list. Of course Edgar was more beloved, but as far as how good player he was, it’s not really close. And I love the heck out of Edgar. Randy being a pitcher, it’s harder for me to compare. I disagree a bit with your assessment of Edgar. Joey Cora was beloved; Edgar was a consistent and clutch masher at the plate. Both Edgar and Ichiro hit for average, but Edgar’s ability to hit for power tilts the scales decidedly in his favor, in my opinion. Ichiro was great, but I remember too many acts of him padding his individual stats that turned me off a bit…bunting down the 3rd baseline with two outs and a runner at 2nd (with the 3rd baseman playing back to concede a meaningless bunt single); stealing several of his bases with the Mariners either up or down by 4 or more runs (defense nearly conceding in both cases). As for Johnson, he might be the greatest LH pitcher ever in baseball…certainly of my lifetime and his generation. Edgar is awesome. But if he was clearly better than Ichiro, wouldn’t he be in the hall of fame by now, since Ichiro is a no doubt HOF’er? I hope Gar gets in next year. Edgar has to fight the bias against DH by some writers. Shouldn’t be that way, but it is. Ichiro gets the benefit of being an excellent defensive RF, whereas Edgar gets the undeserved scorn as having not had to play defense for most of his career. Ichiro also had an extremely successful baseball career in Japan before coming to the US that the HoF also considers (albeit to a lesser degree). Ichiro became an international phenomenon; while Edgar was often overshadowed by Griffey, Johnson, Rodriguez, Ichiro, and even Buhner at times. Ichiro was a stats hound. But I don’t know if it hurt the team. Not over the long term, but those two out bunts clearly drove Piniella (and other managers) to the brink of insanity. The best hitter in baseball refusing the opportunity to drive in a run for a meaningless single to bring a lesser batter to the plate. Then again, Ichiro was a star in the field. Edgar was a DH. A few isolated fans from 2012 shouldn’t cause you apprehension. The standing O he received Thursday tells you all need to know. Any media comments, like mine this week, were about the franchise’s lack of depth that put them in position to need short-term help. Nobody is blaming a seasonal outcome on his presence. Is he hanging on too long? Probably. But as long as he’s not standing in the way of a young prospect, no rational person is putting their dismay on him. I think you are forgetting Art that we have had one of the best concession stadiums in the league for the past 17 years. Where else can you get fried grasshoppers? As soon as major-league baseball switches over to the Top Chef league, we will be in great shape.